What is it? - Seriousness towards any commitment, resolution of a Customer Quality Complaint (CQC) in particular, should be evident through delivery of quality and quantity within a predetermined stretched timeline. Why? - This is expected to result in customer satisfaction through quicker response to the customer, both external as well as internal. Brief History - Many organizations are graduating towards use of Deming wheel (conventionally known as the PDCA cycle) to drive continual improvement. During my Kaizen consulting assignments over the past few years, I noticed that in general there is a lack of firm time dimension to making a commitment, be it for improvement cycle or for making a delivery. One comes across communications such as ‘I will do it’ leaving the ‘by when’ part open ended. Many a time the ‘by when’ part is, by design, left unanswered by the supplier probably in order to accommodate ‘just-in-case’ kind of failures at his end. Many a time, the customer herself hesitates in asking ‘by when’ (in order to avoid tackling embarrassing replies such as ‘very soon (I will do it)’). Why does this happen? Apart from above reasons, sometimes this could be a strategy to remain non-committal to the result-pushy-boss. Result-pushy-boss is the one who just pushes results without enabling the corresponding process. Sometimes it could be because of human inertia to be committal. In the later case, such non-committal situations are difficult to tackle unless there is an intrinsic drive to keep challenging status-quo/s. How does one tackle this? Team members do not worry if they are confident of their boss’s personal participation in the process, if needs be, rather than just ‘pushing’ urgency and results. Good team-leader-(‘bosses’) allay ‘fear of failure’ among their team members while the team works through the committed time-line. 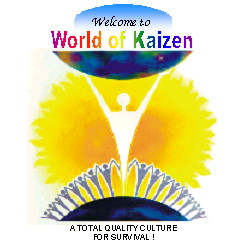 While creating Kaizen culture in Fleetguard Filters Limited, Pune, I introduced the concept of 2-2-2-2(c) culture. It is necessarily a top management led initiative. It should be enabled such that it results into a collective commitment of people to work through the delivery process itself, which achieves a consensus time line as a bye-product. Key is in enabling the delivery process* itself assertively (and aggressively if needs be) rather than just pushing timeline/s so that the 'sense of urgency' evolves across the company. Making a beginning of implementing this idea with CQC gives a head start to this 'top management led transformation' because buying in to the customer priority was easier to convince everyone about. How? - The 2-2-2-2© concept may be understood through the EESTEE™ 2-2-2-2© Factor x Response Matrix. It gives 2-2-2-2© time dimension to the conventional 7-Step PDCA method of problem solving. The 7-Step PDCA methodology with 2-2-2-2© timeline is not only applicable for Problem solving (such as CQC), but also for processes such as Decision making, Managing Improvement projects, Managing 'Voice of customer' that a visiting marketeer is expected to prompt/capture/record proactively during his normal customer visit, etc. In the context of a CQC, the 2-2-2-2© might mean 2-Minutes, 2-Hours, 2-Days, 2-Weeks time bound response to the customer for a given level of performance a typical company might be striving for. The time bound response is necessarily supposed to be at the level of eliminating root cause/s (conventionally known as CAPA) rather than stopping at the first aid (containment) level action. In the context of other business situations, the timeline may be different. For instance, in the context of an emergency/crisis situation, it could mean 2-Seconds, 2-Minutes, 2-Hours, 2-Days. In the context of an improvement project, it could mean 2-Hours, 2-Days, 2-Weeks, 2-Months. It could mean 2-Days, 2-Weeks, 2-Months, 2-Quarters for a development project. It could mean 2-Weeks, 2-Months, 2-Quarters, 2-Years for a change management program, and so on. The 2-2-2-2(c) timeline itself can evolve based on future need in terms of the level of performance aimed at. For instance, in the context of a CQC, timeline might evolve to be 1-1-1-1(c) implying 1-Minute, 1-Hour, 1-Day, 1-Week for a given level of performance. Or 2-Seconds, 2-Minutes, 2-Hours, 2-Days for a higher level of performance. Or it could mean 2-Hours, 2-Days, 2-Weeks, 2-Months in case of a business situation that is of complicated nature needing more time to show effective results. For instance, a typical 'Voice of Customer' may demand more time to do in-depth analysis & verify effectiveness. The intention of such timelines should be to stretch the business performance realistically such that continual improvement attitude is nurtured. The 2-2-2-2© timeline is symbolic in the sense that once the targeted quality, quantity and the timeline is set by consensus, at least in 80% cases it should be achieved if not possible to better it. In remaining 20% cases the timeline may be revisable to realistic one. The top management should enable driving of the 2-2-2-2© timeline as a passion that each employee would strive for. The leaders in the drivers' seat should be conscious enough not to allow it to be a mere slogan just because the term itself might be impressionable and easy to remember. In effect, this is a concept with an intent that needs to be fulfilled with serious commitment. FAAAI (AOTS Japan) Expert Faculty (on Industrial and Japanese Management), Business Coach, Management Author. * Read 1-1-1-1(c) in chapter 6.0 of the book 'Visual Management through Five-S' authored by Shyam Talawadekar. The reader may be able to pick up a few guidelines there that help enabling the delivery processes. This is the exclusive legal IPR © property of www.worldofkaizen.com owned by Shyam Talawadekar. Without the consent of On-Line-Education Controller Committee, it may not be reproduced or shared with third parties.